This post is going to be short and sweet. I am dedicating it to my friend Patti, who recently confided in me that she has never eaten cauliflower. After I got over the shock of her secret, I realized, hey maybe there are other cauliflower virgins out there. If you are new to this cruciferous vegetable, the hands-down, best-tasting way to prepare it is by oven roasting. And if you are wondering, “what's so great about cauliflower?”, I already wrote a post that answers that question! When selecting cauliflower, look for a head that is clean, creamy white with compact florets and firm to touch. Avoid cauliflower that has brown spots or a springy texture as these are indications the cauliflower is old and no longer fresh. Store cauliflower in the refrigerator until ready for use. If you are feeling adventurous, you can make potatoes, rice and even hot cereal with this veggie wonder! All three are low-carb alternatives to otherwise high-starch dishes. With a sharp knife, remove core from cauliflower and cut into bite-size florets. To a medium size mixing bowl, add cauliflower, garlic, salt and pepper. Drizzle with oil and mix. 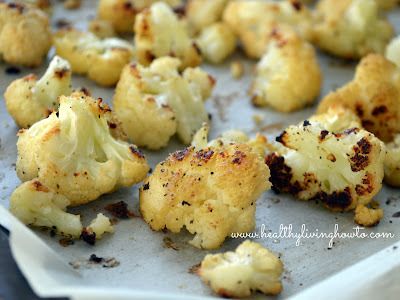 Spread cauliflower out evenly on baking sheet and bake for 30 minutes, or until fork tender, turning every 10 minutes. You will notice I use "high-oleic" also called "high-heat" sunflower oil in this recipe. When cooking at high oven temps, it is important to use an oil that is not damaged by the heat. High-oleic sunflower oil has little taste, is safe up to an oven temp of 460 degrees F and is a rich source of oleic acid (80+%), the same monounsaturated fat found in olive oil.